Jenni is without a doubt one of the most interesting up and coming player in our sport at the moment. 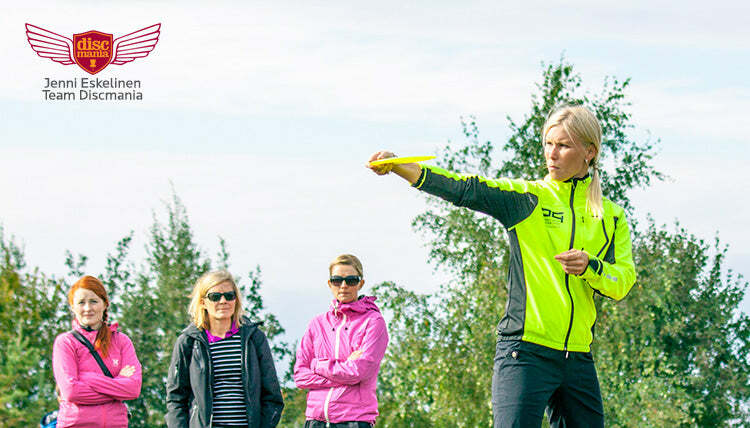 Hailing from the Disc Golf crazy city of Oulu in Northern Finland, Jenni has only been a PDGA member since early 2013 but already boasts a very impressive track record. Out of the 25 total events Jenni has played in, she's won 10, most memorable victory being the 2014 European Championships in Geneva. We were able to do a quick interview with Jenni, who is currently in her off-season training mode, working as a Sports Instructor in Virpiniemi Sports Institute. First off - Welcome to Team Discmania! What can we expect from the reigning European Champ on season 2015? 2014 was clearly the most successful season in my short career with Disc Golf. The European Championships and many other great events laid a solid foundation for the upcoming season, which I expect to bring even more success in Finland and abroad. I'm still fairly new to the sport and very willing to gather more experience as a player and a competitor. I will enter the season 2015 filled with excitement and motivation. My goal is to finish strong on the highly competitive Finnish Pro Tour as well as in certain selected PDGA Major events. I always get hyped up for big events and as I have yet to participate in a PDGA Major, so those events I'll be looking forward the most. Do you have any short term or long term goals in Disc Golf? My main goal is to develop myself as a player. This naturally is and always will be a work in progress but I feel that with the experience gained through different tournaments and determined training, I've got my sails set in the right direction. On season 2015 I aim to develop my technique as well as my mindset as a tournament player. My long term goal in Disc Golf is to be able to play on a high level as long as possible, but also to be involved in the growth of Disc Golf, making the sport bigger and more recognized among traditional sports. Starting the 2015 as a member of Discmania Tour Team will cause some changes in my bag, as so far I'm only familiar with a few Discmania models. Out of the current Discmania line up my current favourite is the S-line PD, which I use for long hyzer shots in just about all conditions. I feel that building a new bag with the discs Discmania has available will be an exciting challenge and I already know that there's multiple great options to choose from. Naturally winning the European Championships in Geneva last year was the biggest and most memorable achievement to date. Also the Disc Golf training course in which I worked as an instructor in 2013 was an important milestone for me both as a player and a Sports Instructor. What does being part of Team Discmania mean to you? Accepting Discmania's offer to sponsor me means a lot to me. I feel honoured that a company like Discmania sees potential in me and wants to support me as a player. I'm excited to see what the 2015 season will bring and what we can build together with the Disc Golf driven Discmania staff. Like Jenni, Niko also resides in Finland. His home town of Ylivieska is located a little under 100 miles south of the North European Disc Golf hub of Oulu. Niko has been a PDGA member since 2013 but has still managed to rack up 10 number 1 finishes in PDGA sanctioned events, scattered across Junior, Amateur and MPO divisions. At the pristine age of 17, Niko is and will be force to reckon with in the future events of the sport. His biggest achievements to date include a silver medal in the 2014 European Championships as well as the Finnish Champion title in MJ16 from 2013. We caught some quick questions also from Niko to introduce the new face to the Discmania family. Welcome to Team Discmania! What can we expect from you on the 2015 season? I'm expecting a big smile on my face from the joy of being able to play the sport I love. I hope to contribute some great frisbee spirit along the Disc Golf community. Tournament-wise I'm especially looking forward to my PDGA Major debut and the 2015 Finnish National Championships in Lahti, Finland. Yes I do. After I found my motivation again, I want to keep it growing. Having fun and enjoying the sport and the people is my key to success, that's my long term goal. I love throwing accurate putter shots, and for that, I use P-line P1. It's a disc that features a huge amount of glide and a very straight finish. I literally can't keep my eyes off it when it's in the air. You can also see me using my first run P-line MD2 a lot. It flies pretty similarly compared to the P1, but soars further and features a very nice late turn, that makes the MD2 very trusty midrange disc for me. On the other end, when I need a long distance shot, I use the C-line PD2. I also use this disc for sidearms. The PD2 pretty much does everything for me on long distances. Definitely the most memorable has to be the European Championships in Switzerland last year. The overall experience really stands out for me, including my 2nd place finish, the team spirit of the whole Finnish team and the Finnish "sisu" that was shown in Team Finland's overall performance. It's a matter I'm very proud of. It's like opening the doors to a candy store as a kid. I'm already anxiously waiting for all the opportunities that will follow with me being a member. It's a great honour being a team member of the most stylish and credible Disc Golf brand out there. See the full Team Discmania roster here!